ML Book Collection indicates that the sources in this category are in the general collection which is located on the 1st floor (A Block), 2nd and 3rd floors of the Library. The books in this collection are borrowed for a long time. ML Rare Collection indicates that the source is in the Rare Items section on the 3rd floor of Block B. These resources cannot be borrowed, but some parts of it can be photographed. ML Journals indicates that the source is included in the collection of periodicals which are located on the 1st floor of Block B. Periodicals in the current Magazine Shelf cannot be borrowed, but articles in it can be photocopied. Periodical publications in the Bounded Magazine Shelves and archives can only be borrowed for 7 days for graduate, doctoral students, and academic staff. In order to get the periodicals published in 2012 and earlier years, the "Journal Stacks Request Form" under the heading "Forms" on the Library's Web page is required. Reference Collection (Entrance) indicates that the source is located in the Reference Room on the ground floor. These resources cannot be borrowed but some parts of them can be photocopied. METU Theses indicates that the source can be requested from the Reference Room on the ground floor. Theses cannot be borrowed; however, it can be photocopied if the author gives permission or you can access the electronic version. You can request Theses by filling in the "Thesis Stacks Request Form" under the heading "Forms" on the web page of the Library. ML Kasım Gülek Collection is made up of books donated by Kasım Gülek Family in the name of Kasım Gülek. This collection in which some of the books date back to 19th century covers different topics published in many countries of the world, particularly in the field of history and economy. Books in the scope of this collection can be examined in Kasım Gülek Hall located on the ground floor and are not allowed to be taken out of this hall. Circulation Desk (Entrance) indicates that the source is in the Long Term Circulation Desk.These resources can only be borrowed for 3 days. ML Reserve Collection indicates that the source is in the reserve area on the ground floor. These resources can be borrowed shortly (hourly / daily). The Book Stacks Collection indicates that the source is kept in the stacks. These books can be used by filling out the "Book Stacks Request Form" under the heading "Forms" on the Library's Web page. The books in the stacks can be borrowed for a long time. ML Project indicates that the resource is being used in a project that is being run at our University. Along with this note in the "Location" field, ‘Status’ field also shows the date the book should be returned. When these books are returned, they are included in the general collection and the "ML Book Collection" note begins to appear in the "Location" field. METU Legal Counselor gives the knowledge that the source is in ODTÜ Legal Consultancy. The "Status" field in the catalog record includes the date on which this resource will be returned. When these books are returned, they are included in the general collection and the "ML Book Collection" note begins to appear in the "Location" field. Books can only be borrowed after seeing this note. Muhan Soysal FEAS indicates that the source is in the Muhan Soysal Library, which is located in the new building of the Faculty of Economics and Administrative Sciences. Some of the books in this collection can be borrowed for a long time while some can be barrowed shortly. For further information, please call (+90.312) 210 30 52. The EDC FEAS New Building indicates that the source is in the European Documentation Center located in the new building of the Faculty of Economics and Administrative Sciences. These resources cannot be borrowed but some parts of them can be photocopied. For more information, you can visit the ADM Web site or call (+90.312) 210 36 29. OGUZ-KALBİYE TANSEL LIBRARY (Department of Turkish Language) indicates that the source is in the Oguz-Kalbiye Tansel Library located in the Turkish Language Department. These resources cannot be borrowed. Marine Science Ins. (Erdemli / Mersin) indicates that the source is in the Marine Sciences Institute which is located in Mersin. NCC indicates that the source is located in North Cyprus Campus Library in Güzelyurt. For more information, you can visit the KKK web page or call (+90.392) 661 20 81 / (+90.392) 661 20 82. 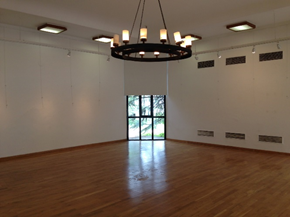 Furuzan Olşen Exhibition Hall is 100 square-meter and located at the entrance of the Library. 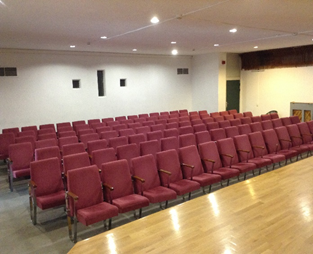 The Hall can be used for exibitions, conversations, etc. during the Library's working hours. Please visit the Events Calendar for occupancy of the hall and call (+90.312)210 27 92/ (+90.312) 210 27 94 or send an e-mail for booking. The Solmaz Izdemir Hall is 139 square-meter and located on the basement floor. The Hall can be used for audio visual course purposes by lecturers, and student society activities during the Library's working hours. It has 110 person seating capacity.